We have a caged transit tipper which pulls a secondary caged trailer - so there's no job too big or small when it comes to your rubbish uplift. Call 07856910054 now for a quote - we'd be happy to help you and answer any questions you might have! To make it easier to help you, it's best to have a list of the items you'd like removed, even some photos from your phone or camera, which you can email us - this will enable us to give you the most accurate quote possible. Alternatively, take a look at our prices page, which gives some examples of pricing. 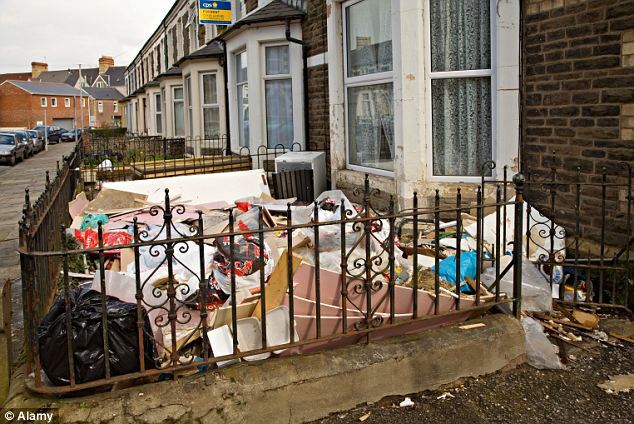 Householders who regularly dump rubbish in their own garden will be guilty of a criminal offence and hit with a hefty fine. The penalty will also apply to anyone who leaves an old sofa or fridge in their garden, or has mountains of pizza boxes or takeaway cartons lying around. They will receive an on-the-spot fine of up to £100 or be taken to court – where the maximum fine would be £2,500. The new Community Protection Notice is a key part of new anti-yob laws unveiled by Theresa May today. Ministers want to stop irresponsible homeowners or tenants from blighting whole streets or neighbourhoods by turning their front garden into a ‘dumping ground’. The powers will apply to privately owned homes as well as council houses. Officials will target only those guilty of ‘persistent, unreasonable behaviour’. They will be given a warning and told to clear the rubbish away. If they ignore the notice, they will then be guilty of a crime. Officials do not want to target law-abiding householders who are forced to have rubbish in their gardens at certain times of the week because of the complicated recycling policies introduced by many councils. And the law will be worded to protect homeowners from over-zealous council officials patrolling the streets looking to make money by issuing on-the-spot fines. Residents have been given penalty notices for putting their rubbish out on the wrong day or for not shutting their dustbin lid properly under existing ‘bin laws’. Today’s antisocial behaviour White Paper also sounds the death knell for Labour’s flagship Anti-Social Behaviour Order, which is to be scrapped. There will be a bonfire of Labour’s anti-lout legislation – with 19 powers reduced to only six. The Community Protection Notice could be issued to an individual or responsible person within a business, such as a takeaway shop. It will also give police – and not just town halls – the power to deal with noisy neighbours in the middle of the night. an individual who regularly allows their dog to foul in a communal garden (this situation is not covered by current notices). an individual who regularly dumps rubbish in their front garden. a takeaway which persistently allows customers to drop litter on the pavement outside and causes noise nuisance late at night. Breach of any requirement in the notice, without reasonable excuse, would be a criminal offence, subject to a Fixed Penalty Notice or prosecution. But victims were saying that time and time again nothing was happening, she said. 'What we've seen over the years is too many people having their lives blighted by anti-social behaviour. She went on: 'What we will see is anti-social behaviour being taken seriously and being dealt with. Ministers are determined to get a grip on low-level thuggish behaviour. The Asbos were routinely breached by thugs, who quickly considered having one of the orders to be a ‘badge of honour’. They were also given out in some bizarre circumstances. A woman who tried to kill herself four times by jumping off bridges was banned from loitering on bridges, going on to railway lines or entering multi-storey car parks unaccompanied. And an 88-year-old man from Merseyside was banned from swearing or making sarcastic remarks. Asbos will be replaced by Crime Prevention Injunctions, which officials say will be easier and faster to impose. Unlike the Asbo, the injunction would not require a magistrate to be certain that the defendant had acted in an antisocial manner. It would instead be secured against a lower burden of proof.